As a child, there was always a family relative who meant well by buying me a gift, but most of the time got it a bit wrong. You see, if you don’t have children, or do but they’re a different age or gender, it’s often hard to know what to buy as a gift. My children, have grown to accept that there’s one Auntie who always gets it wrong, last Christmas one was presented with a Thomas the Tank engine pencil, while the other received a spoon and some socks split from a multi pack to make the parcel look a bit bulkier (I guess they were practical..). 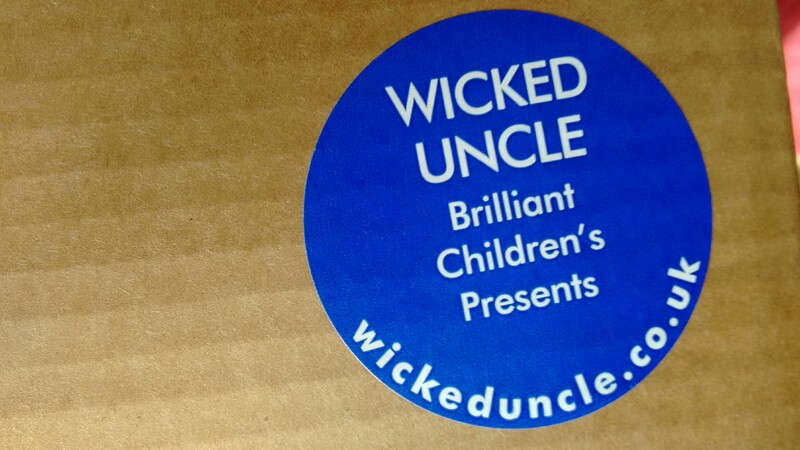 So, when Wicked Uncle offered to leap to our rescue and show Auntie what she should be buying the children, we had to say yes! When Tree Fu Tom hit our screens on Cbeebies, my eldest son instantly loved the programme and would tell everyone his favourite programme was “Tree fu Tom! !” and they would mostly look back with confusion as they tended to be people who had yet to be introduced! A couple of years on, I’m glad to say that when he talks about Tree Fu Tom, he gets less confused looks and more “oh!! that’s the one with the boy in the acorn hat! !” to which he usually replies in a disgruntled manner “no, that’s Twigs..”…but I digress. I have to say, I was really impressed with the Tree Fu Tom magazine, the free gifts were actually very playable with and the wind up toy has been in daily use since it arrived! The magazine itself is a great balance of a stories, educational activities and fun, my youngest son loved the cutting out! It’s very good value, and we will definitely be buying it over the next few weeks! The carry along colour set is ideal for taking on days out, it’s small enough to fit in my handbag but big enough that the images are fun to colour! The boys both enjoyed this, and I enjoyed the peace and quiet of some colouring time! The search for Squizzle story book, features lift up flaps which the boys both enjoyed unveiling to show us what was coming next in the story! My eldest son who is 5 enjoyed the story very much, and attempted to read some of the story himself, my younger son (aged 32months) wanted to fast track some of the pages and just turn the flaps! I very much enjoyed reading them the story, and liked the fact they still get to be active while reading – there is a bit where they need to do the tree fu moves! We were also sent a fabulous DVD which arrived with a tree fu tom figure, this has been played with none stop and I noticed the boys acting out the adventures while watching the DVD! There are six full length episodes on the DVD, and we found that watching them one at a time was plenty! After watching one episode the boys wanted to go outside and explore or act out Tom’s adventures! This was great fun, and was a perfect starting point to lots of our half-term fun! Items available now from all good stockists! 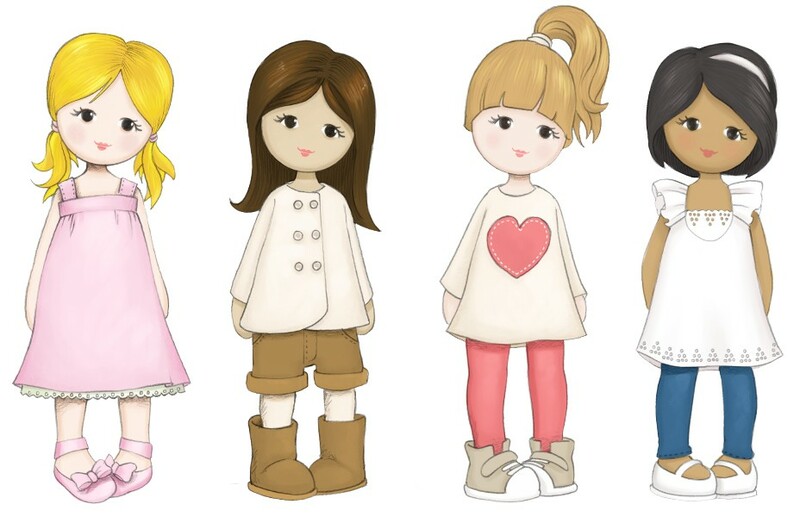 #WIN a fabulous Doll from Little Us! Little Us is a brand new range of enchanting dolls, each one with her own unique personality. Which one is most like your daughter?– maybe it will be Chloe who likes everything pink, or Amelia who loves animals and reading, or perhaps it will be Ruby who’s just a little bit cheeky, or finally Mille, the tomboy of the group! Read the Little Us stories and follow their adventures on their Facebook page www.facebook.com/LittleUsdolls. Dolls are available to purchase from Amazon RRP £9.99. You can also enter to win a doll by following the simple steps on the Rafflecopter widget below! 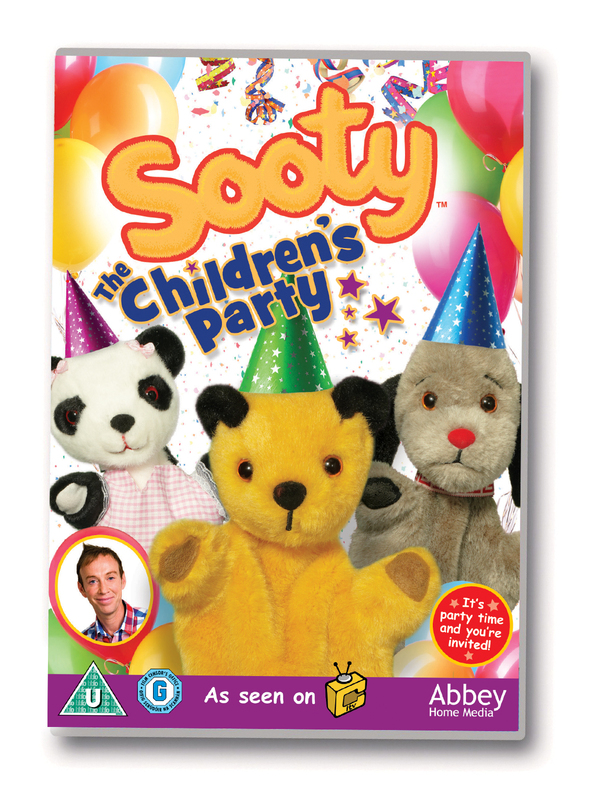 The Sooty Show – The Children’s Party DVD! I used to really enjoy watching Sooty as a child I used to find Sweep hilarious, but it’s not something my boys have had the chance to watch until now! Abbey Home Media kindly sent us a copy of the new The Sooty Show DVD! Boo sat down to watch the DVD reluctantly, but within minutes was totally captivated and laughing hysterically! He adored Sooty and Sweep and found Richard very entertaining! Each episode is full of fun and chaos in true Sooty style! Boo’s favourite episode was the one at the beach he said “I loved the episode at the beach when Richard threw the ice-cream, it was so funny!” – that episode featured Frank Bruno! I can honestly say this is perfect half-term entertainment, plenty of laughs and family friendly fun! The Sooty Show – The Children’s Party is available now! If you’d like the chance to WIN 1 of 5 copies on DVD follow the simple steps on rafflecopter below! We were sent a fabulous selection of NICI products from the Jolly Logan Range, which depicts a Wolf dressed as a sheep and a sheep dressed as a Wolf! They’re a fabulous range of gifts with something to suit all the family! I think this beautiful soft toy would make a lovely gift for anyone who’d like something to make them smile! Ours is on time share between the boys, and has already been on several adventures, he seems to be doing well to help E get over his fear of the big bad wolf in fairy tales! I envisage Logan wolf being taken on many expeditions over the next years – photos to follow! This NICI bag is super cute, it’s big enough to fit in a A5 notebook and super soft to touch! With a great adjustable strap which can be worn across you or just on the shoulder, it’s sure to be a hit with children and adults alike! The boys have discovered Logan Wolf fits very well into the bag too..
Boo was most excited by the notepad, where he has recently started reading and writing he is very keen on nice notebooks and this one really captured his imagination! He instantly noticed the bookmarks and found homes for them in his school books, then took delight in writing his “own book” in the notepad. The note pad has plain pages so it’s perfect for any age group whether they want to sketch or write their ideas! For me, the most exciting item in the parcel was the money tin. Growing up my sisters each had a money tin, and while I always wanted one, I never did get one, until now! Yes, I have claimed this as mine! Firstly, I love the design – who could fail to like the cute sheep dressed as a wolf? Secondly, I love the fact this tin has a lock and key as it discourages just dipping in to the savings! The tin is a great size and there are two keys, (one for me and one for Mr G!) which means you can keep one key safe for your loved one if you give it as a gift. It’s such a cute design, I love it! You can keep up to date with NICI on facebook and see all their latest ranges. Disclaimer: We were sent a selection of NICI items for the purposes of review, all thoughts and opinions on the items are my own. 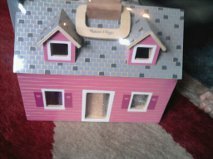 We were delighted to be sent the Melissa and Doug folding dolls house to review. If you think dolls houses are just for girls, think again! When the box arrived Boo couldn’t wait to see inside, I was pleased that we weren’t overwhelmed with packaging, and the house is just packed tightly in plastic so it is easy to get into! The folding dolls house comes complete with furniture and two dolls – they even have a flat screen television! The furniture is really nicely made, and sturdy enough that small hands can move it about and drop it without fear of damage. Boo spent quite some time arranging and rearranging the furniture but didn’t pay much attention to the dolls. At that point I realised he wasn’t quite sure what to do with them, so I picked one up and started to get it ‘talking’ he picked up the other doll and joined in! He soon was making the dolls go out of the door to ‘work’ or ‘cook’ in the kitchen, his imagination has really developed in just a few days! There are no latches or catches to hold the house closed (so nothing for small fingers to get caught in! ), simply carrying the house by the handles keeps it tightly closed! The handles are very smooth wood, and Boo easily carried it to show the rest of the family at the weekend! WoodenToyShop.co.uk sell this gorgeous house for £28.77 which I think is a complete bargain, it is great quality and I would most certainly buy one as a gift!